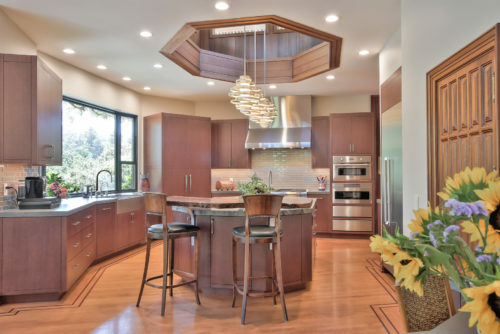 This kitchen was designed to create better flow for entertaining while keeping it relational to the architecture style of the home. 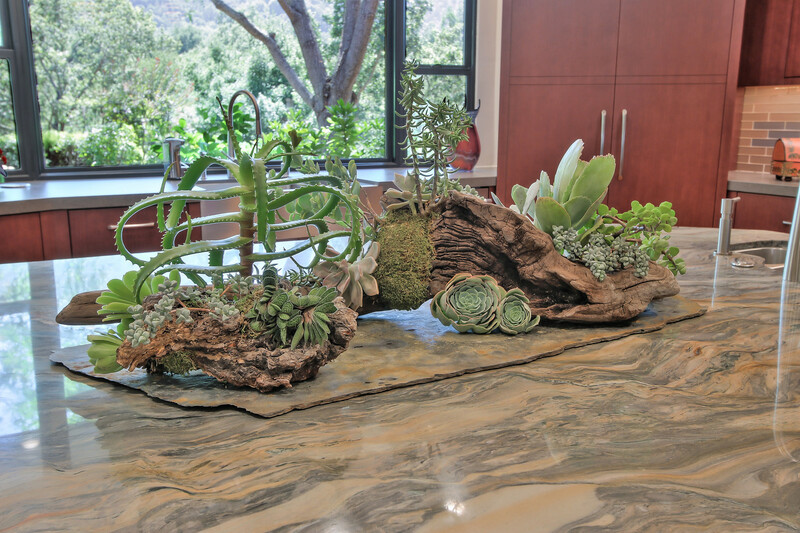 The creation of two work stations were strategically set up for catering teams and the homeowner’s cooking hobby. 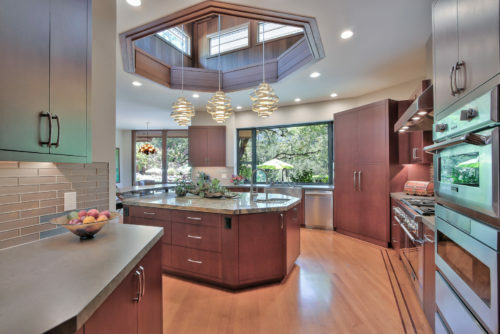 The design was strongly influenced by the existing natural finished old growth redwood octagon ceiling, which is a dramatic design element within the space. The new Claro walnut natural live edge bar counter harmonized with the 1970’s retro look in the George Nakashima style. The architectural style of the home imitating many of Frank Lloyd Wright’s modern design characteristics of the 1940’s dictated the design aesthetic. 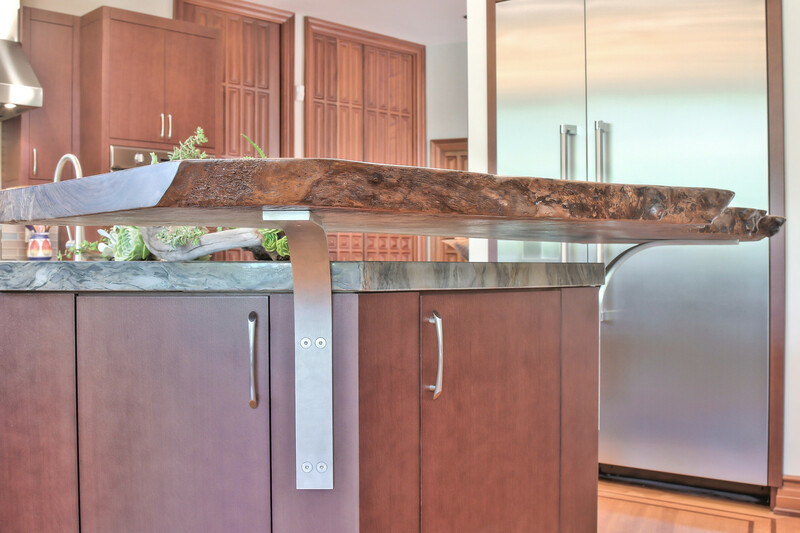 Create two unobstructed work stations for catering teams and homeowner’s cooking hobby. 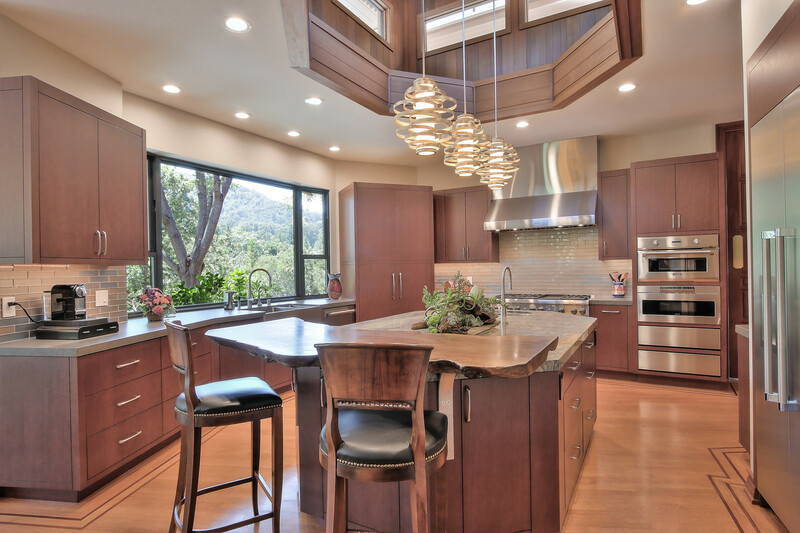 Create functionality of a commercial kitchen in a family kitchen setting. Keep kitchen design relational to the architecture of the home. An existing 3.5 inch mahogany pin stripe spacing from cabinet toe kick on the floor could not be altered in the design. The positioning of the island was determined by the existing old growth redwood light tower octagon. 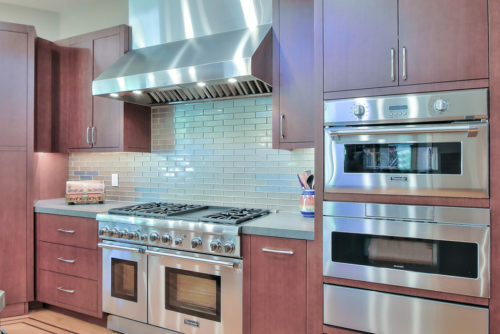 Original kitchen included only down draft ventilation which was inadequate for desired new gas cooktop. Increased island size to allow for adequate drawer base storage. Adding a larger island sink created a better prep area near the range. Moved cold storage so size could be increased, improved food prep and cooking work triangle. Relocation of the gas cook top from the island allowed for ventilation hood install with greater CFMs for the new Range that has higher BTU output and optimum work spaces triangle. All changes were designed around an existing mahogany floor stripe. 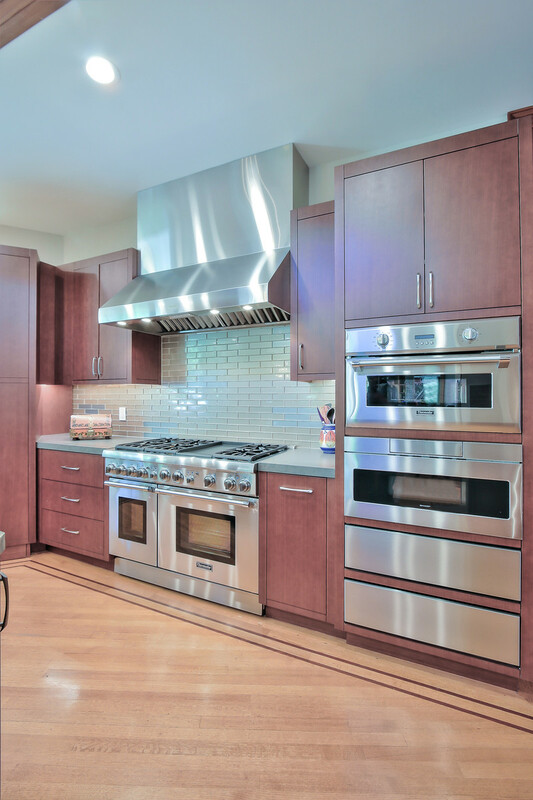 By only adding 6” to the stripe at the refrigerator the desired effect and changes were incorporated. 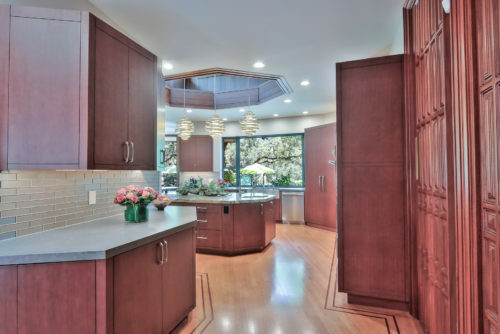 Chosen cabinet style bridged the 1970’s architecture with Frank Lloyd Wright’s modern 1940’s into the current century. 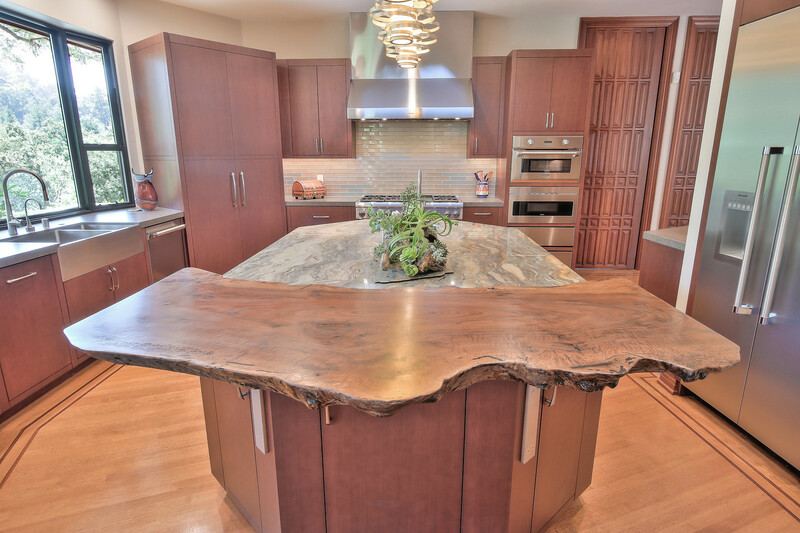 Claro walnut live edge bar counter top accommodates seating for two in the kitchen. 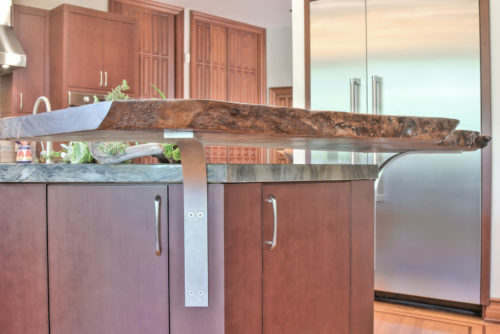 Custom designed stainless-steel brackets allow for unobstructed knee space and illusion of floating counter top. Walk-in pantry with adjustable shelves located within the kitchen for tall storage. Royer Designs is run by Stan Royer, a Design Strategist with more than 15 years experience in Interior Design, Interior and Exterior Layout, space planning and home remodeling. Located in the San Francisco Bay Area.